The Rambla de Castro Punta Pejes Reyes. 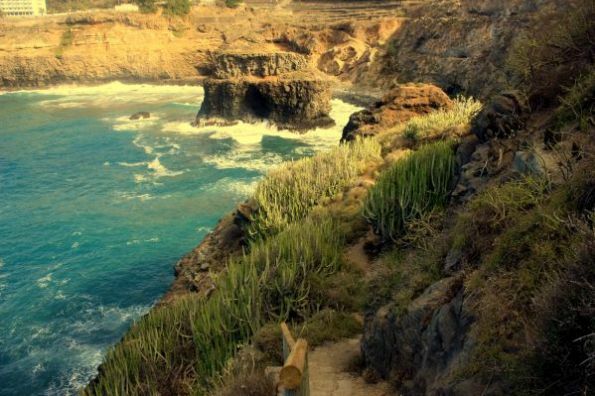 Indeed since 1987, the Rambla de Castro with Cape Punta Pejes Reyes has been part of a huge coastal terrain of protected spaces (nature reserves) of Los Realejos. 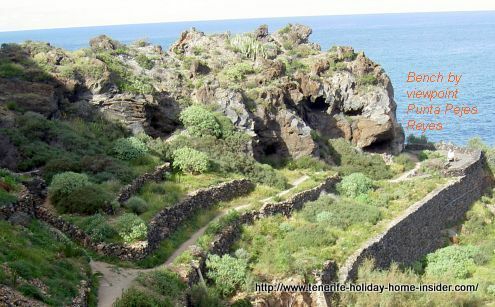 So are the hiking path Sendero del Burgao or Burgado as well as beach Playa de los Roques. However, the prominent Cape with its steep granite rock outcrops is often overlooked by people who walk the principal route for the first time contrary to Punta Gorda to the right of Hotel Maritim. The Punta Pejes Reyes is on the Northwest side of beach Playa de los Roques. The seashore can be seen below the signboard on Calle Burgado of the Maritim Hotel. The pointers indicate La Casona and Mirador San Pedro. Generally, tourists don't walk further than that on the entire, long coastal Rambla. Getting to Cape Punta Pejes Reyes. It takes about 15 minutes to walk to it from the mentioned Hotel. The Cape's rocky outcrops that are visible from far flank a most picturesque part of the Atlantic shore. Punta Pejes Reyes with lookout point marked in the photo. Two very striking rocks in a small bay of the Realejos beach de los roques form part of the scene. You will see a deviation on the right to the Punta where it folks off the main track to a lookout point with benches. 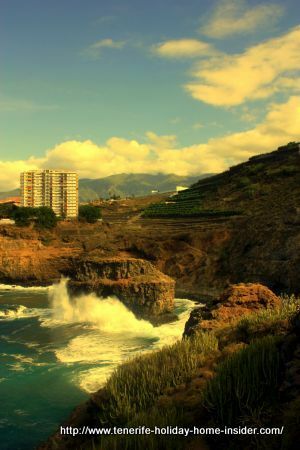 Rambla de Castro origin as part of Orotava Valley. 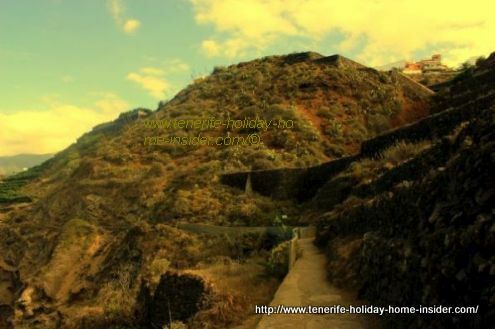 The gorge of the Burgado or Burgao and its slopes by this terrain of the coastal walkway to San Pedro were formed by the massive volcanic landslide that created the Orotava Valley. 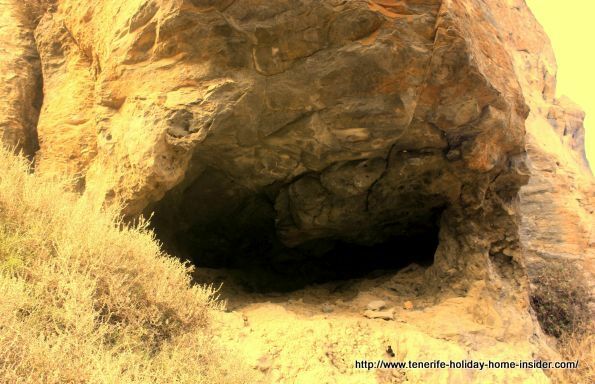 The result of it is pristine Tenerife nature that is typical by Atlantic ocean Lava areas. 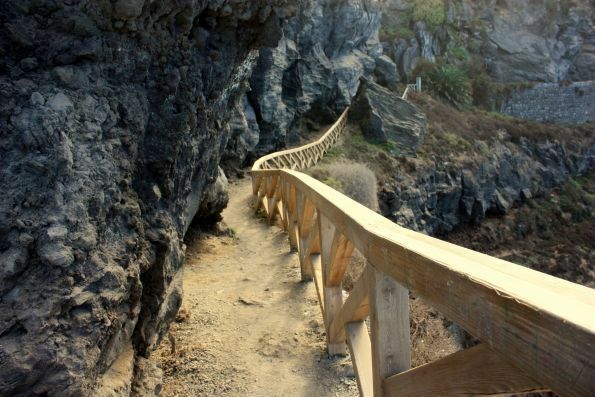 Wooden steps by el Roque Grande of Playa de los Roques. Tabaiba by West side of Playa de los Roques. You find man made wooden steps that lead along Tabaiba dulce shrubs and other low, endemic Euphorbias after about 80 meters. 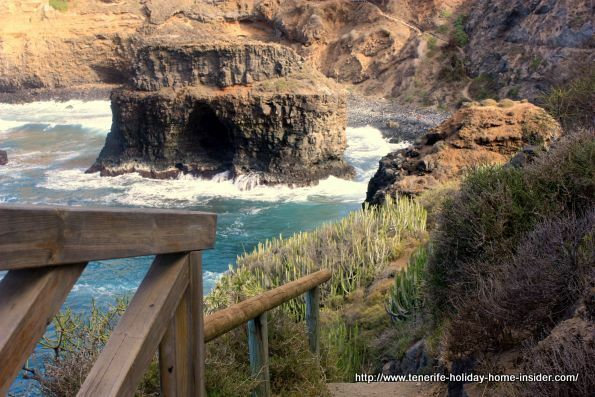 There, you can admire the powerful waves where they hit the big rock El Roque Grande of the beach below. In fact, a couple of benches welcome you by this lookout point. Cave in multicolored rock with red copper traces. A small cave behind in the rocks which hints at Copper mineral content is big enough to offer shelter. The track of Pejes Reyes leads around this outcrop. It opens breath taking views to a long hiking path with a timber rail next to steep grounds and wild Atlantic waters below. The path winds its way around the ocean sides of the Punta and leads through a small tunnel at one stage. All in all the detour doesn't take more than twenty minutes to get back to the main hiking path with the Sendero Burgado track. From Rambla de Castro Punta Pejes back to the main coastal Rambla article. Giving credit to the fact that Punta Pejes Reyes is part of Rambla de Castro in a different context in Spanish here.